Worship teams and other ministries wanting to spend less time on the administrative aspects of leading, and more time on relationships and expanding God's Kingdom. Based on number of Leader accounts needed (3, 10, 25, or 50). 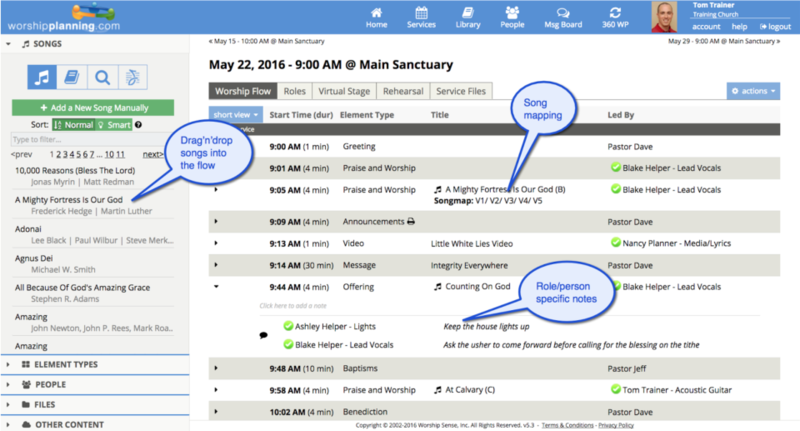 WorshipPlanning.com is one of the most comprehensive worship service planning software on the market. Voted 5 stars by users and top editors pick 6 years running, it is designed to help you create and organize multiple services and worship flows, organize your teams, schedule people to serve, and centralize your library of music for on-the-go access by team members. Pros: It is simple as you want it to be and deep as you want it to be. In the short term and for the quick and easy it can put together a program in minutes. In the long term as you keep using it and the repertoire grows, it is fast and doesn't miss any administrative events. I depend on it and I haven't missed a beat. As a leader, it puts the onus on the team to follow through on assignments that and cover for subs when called for. As a communication tool I use it to organize any kind of concert as the timeline is flawless in sticking to a timeclock. So good is its coverage that I often use it in broadcast TV situations along with Pro Presenter. Cons: It competes and exceeds performance of other software packages, but doesn't have the exposure and marketing advertising that others may have because the company puts its resources into the software. That would be a "con" to some who are interested in having marketing rule their brand. Wow! Thank you so much for the great review, Yabo! This website is a lifesaver for organization and communication between our staff and volunteers. Pros: We use Worshipplanner.com daily to send emails to volunteers, upload files for our worship team, schedule volunteers and create detailed services. It's connection to Songselect is very useful as we choose music, as is it's ability to make detailed notes for everyone involved in Sunday morning. The unlimited storage is also a definite plus for us. Cons: There are really very few issues we have come into with this website. I think the versatility of copying/linking services could be somewhat improved but overall there is not much to complain about! Thanks for the feedback, Anna! 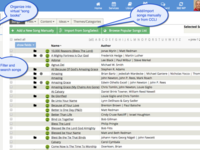 We're especially excited to hear that the SongSelect integration is helpful! Keep an eye out for more similar integrations! It's good to know that copying/linking services could be a little smoother for you. We'll take a look at how we can improve that area. Worshipplanning.com has been a great tool for us in planning worship and related tasks. Pros: It's intuitive, it's easy to learn and use, response to feedback and enhancement has been superb, and it's expandable for use by many different types of ministries. 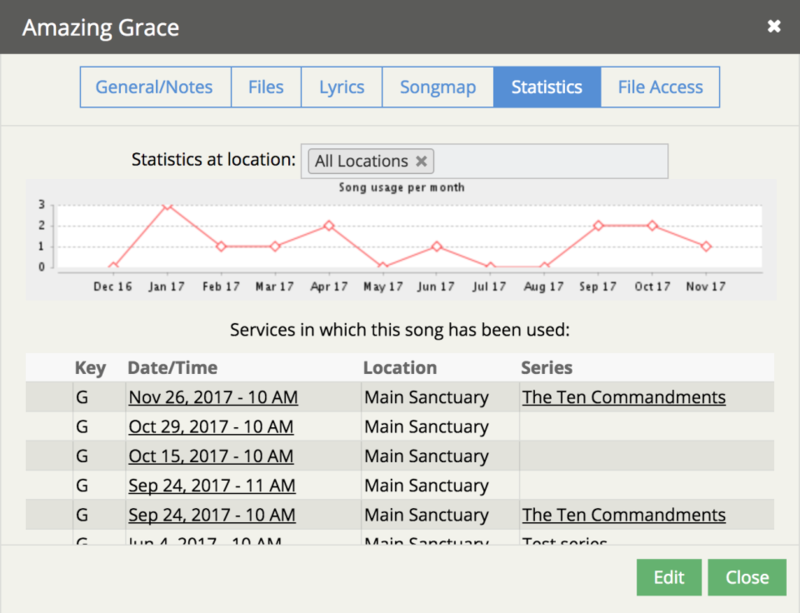 We not only use it for worship planning, but we use it for kids and student ministry as well, and also as a type of database for storing files and other info in logical ways, and making that info available to others. Cons: Like any software, I have several small nits - small nit-picky things that I'd change in the way that it behaves, or enhancements that might make a common task for me more easily accomplished. But overall, I'm very happy with it. Overall: Great planning tool, great way to distribute information across many different ministries and people. Thank you for the great feedback, William. Overall the product is very useful and provides our music ministry with what we need. Pros: No paper for our rehearsals! Everything is centralized! Everything is consistent! 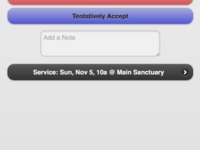 Love the ability to schedule our Praise Team members for different Sunday's they're assigned to sing! Love the ability that allows them to add another person on their team when they're NOT available or something comes up! Love the song books; music library!!! Cons: Not being able to listen to the music and read the lyrics is a big issue! I am hoping this is changed in an upcoming version. Thank you for the feedback, Barry! 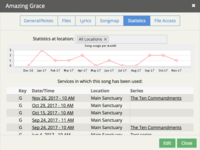 WorshipPlanning.com does allow you and your team to view lyrics and listen to music if that information has been added to the song, so we'll connect with you about where you might be having trouble. Pros: I like that the user interface (from the user side) is simple and easy to use. I've been using it for about 4 years now. Cons: The admin side is quite confusing in my opinion. Especially switching from user to admin. It doesn't work very well. I also don't like that you cannot create a spotify playlist via the admin side. It will create a sort of playlist, but it doesn't direct you to spotify, it only opens a dialogue box that you can list from. Thanks so much for taking time to post the great feedback! It sounds like you've identified a few places we need figure out how to make smoother for you. I believe some of the items you mentioned are possible to do, though we may need to improve how it is implemented if someone with your 4+ years experience is still getting hung up with it. We'd be happy to have a call to discuss, if you're interested. Feel free to give us a call at 877.399.3342 after the holidays, and we'll help you out and figure out how we can improve. Very user friendly. My music ministry members would now be lost without it! Cons: it is a little pricey. Unfortunately, it is a little hard to understand for our older, less tech-savvy volunteers. Overall: The ability for my music team to always know what it going on and what is coming up. Nancy, thank you so much for the feedback! We are always open to ideas on how to make the site easier for _everyone_ to use. Feel free to share any suggestions with us directly. Pros: We've been using WorshipPlanning.com for years, and it has never let us down. It does just what we need without being bloated with stuff we don't need. Every Sunday is organized, and everyone can see what is going on. We have a rotation of disparate music leaders, so having visibility into what has been played recently was important to us. Everyone is now literally on the same page! There are more features available than we use because we are so small. But I can see that there is a lot of power available if we needed it. Overall: Sometimes on mobile the lyrics for a song can be cut off. But that's not something we use often anyway. Thank you for the feedback! We try to keep the more advanced features out of the way when you only need the basic functionality. 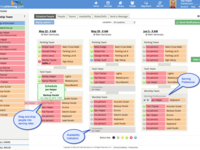 WorshipPlanning.com makes scheduling teams so simple! Pros: The ability to create and manage teams allows ministry planning effortless. 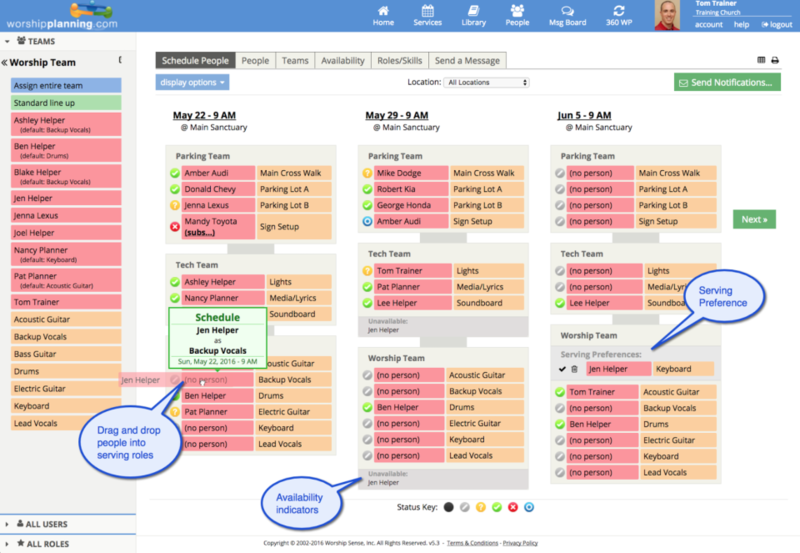 Team members can easily indicate their preferences and availability. The ability to import from sites like SongSelect makes it all very worthwhile! Overall: Team members have expressed that the software can be confusing to use. There are many great functions that take some time to figure out. Thank you for the great feedback! We are always striving to make the software easier to use, especially for volunteers. If you or they have any suggestions, we'd love to hear them. Feel free to contact us directly via our support center (we welcome phone calls) to share your ideas. Pros: Sometimes it seems like music and worship at the church level is like herding cats. WorshipPlanning helps you get control of the chaos which allows you more time to focus on the end product. Cons: I think some others might have also mentioned the challenges in getting some of our older members to take advantage of all that WorshipPlanning can do. Thank you for the review, Danny! Pros: Web based and mobile friendly platform. The entire service and all its elements can be planned out, hosted and distributed quickly and simply. The calendar function is useful for volunteers too. Cons: There is a little bit of a learning curve for administers because this site does so much. The user interface is not very clean looking. Overall: As a volunteer it's great. Simple and easy to use. When doing admin work it requires a bit more know how. Thank you very kindly for the review! We are always trying to lessen the learning curve, and actually have a few updates planned in the next few weeks that should help new users. It's always a balancing act trying to add functionality while keeping the interface simple. But we love the challenge! I have been using worshipplanning.com for a couple of years to help me plan worship. Pros: This software is really easy to use. I have a small team at my church and am able to get the plan entered and send it out in a very timely manner. Overall: I am able to save a lot of time in the worship planning process. I am currently only using the service planning page and scheduling. Thank you so much for the review, Jason! We try to keep a "no church/ministry too small" philosophy, and are thrilled to hear it is helpful to your small team. Pros: Worship planning does a good job of the basic functionality of coordinating the schedule of our team. Cons: Worship planning has pretty basic functionality compared to its competitors and could use a modern design refresh. Overall: Worship planning helps our team coordinate its schedule and get on the same page ahead of our practices. We sincerely appreciate the feedback, Tim. It truly helps us improve! In the 15 years we've been around, our internal development motto has been "be the best at the basics". In other words, while there are many solutions out there with lots of bells and whistles, we feel those often come at the expense of making things complicated and expensive. That said, we've worked hard to keep up with what the majority of users ask for...things like text notifications, self-signups, song arrangement management, and a growing list of integrations with other cloud-based software. Regarding the design looking a little aged, we agree. We are actually in the midst of a user interface redesign. Thankfully, the way we've coded the software allows us to do a redesign without doing a complete rewrite. Thanks again, Tim, for your honest feedback. I'm more than happy to chat with you further about any of these, or other items. Just give us a call at 877-399-3342 and ask for Tom. Pros: My church's worship team has actually been using this for quite some time. The dance ministry was just integrated to this app, and wow has it made a difference! To be able to see the layout of when everything is instead of waiting for "cues" has made Sunday's so much easier! We are able to program how many people will be on that altar, the song list and order, and email everyone. Cons: There are very few problems that we have had. Overall, there is not much to complain about! I wish we would have used this sooner. Thank you so much for the great feedback, Gibeth! It's great to hear how the app is able to help your dance ministry get on the same page. It takes some time to set up, but helps a lot for managing worship team environment. Pros: I like the way the software helps me to manage my teams and communicate assignments. I also like the way it works at a glance to see what my plan is for a given week. It also allows me to import songs from SongSelect and print out lyrics or highlights of the plan for other participants. Cons: I haven't found very many negatives at this stage. Perhaps it would be nice to have additional options for communication with the team. 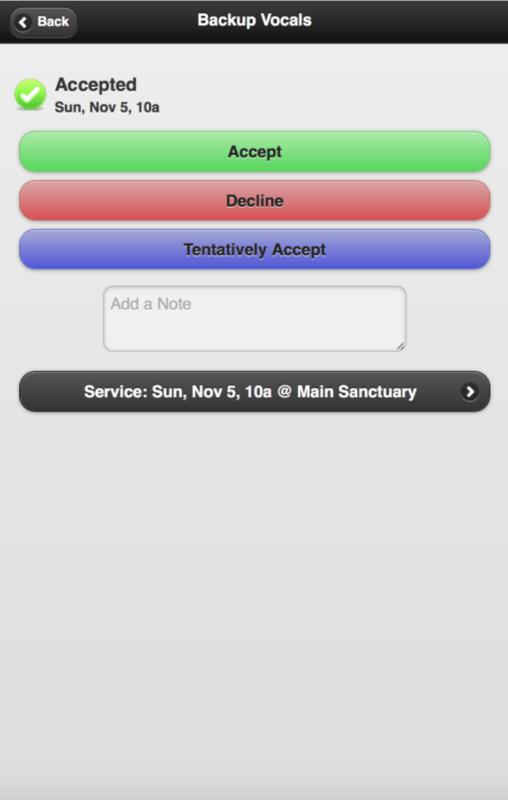 Overall: Excellent tool for planning worship services and communicating with the team! Pros: The cost is great. Like really good compared to other companies. It can do most everything you want it to do. Scheduling and planning functionalities all work well. Integrates with most other programs and platforms you would need it to. Cons: It is not the easiest site to navigate but it does have most of what you need once you learn it. It is not a good looking site either. Overall: Overall it has been solid. It does what we need it to do and the price is great. Thank you for the honest review! If forced to choose, we'd take "solid performance" over "good looking" any day of the week. But you'll be happy to know we are working on a major update that will give everything a new look and make the functionality even more intuitive. As with every customer (or potential customer), if you ever have trouble or issues, you are welcome to give us a call. We are delighted to assist by phone (or email if you prefer). 1-877-399-3342. 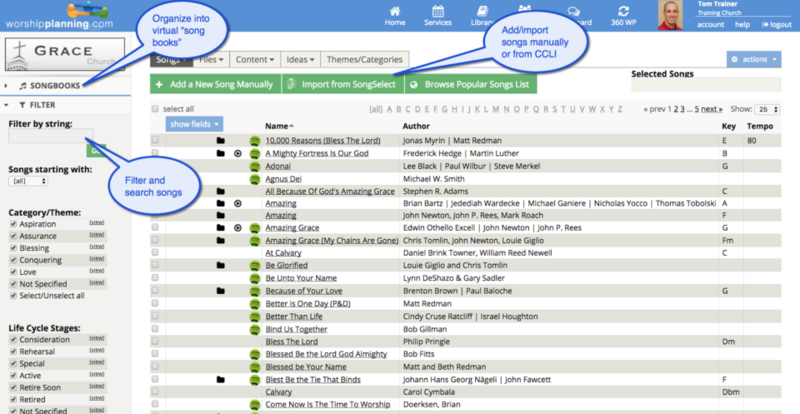 Overall: worshipplanning.com is an excellent product for organizing and planning your worship flow. It has an intuitive interface and outstanding features and functionality. Great value that starts with a free trial!